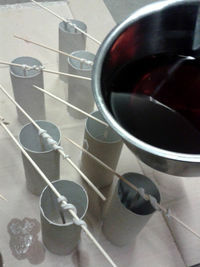 Making candles with (mostly) left-over material. Glue the toilet rolls to the cardboard. Put water in the bigger pan and put the smaller pan in the bigger pan (preferably with something on the bottom of the bigger pan to support the smaller one). Melt the candle wax in the smaller pan. Remove old wicks, pieces of metal and other rubbish with the tweezers. 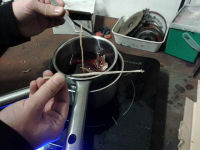 You can use half of a satay stick in combination with a paperclip to center the wick. 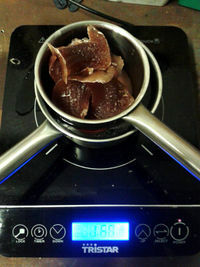 Pour a bit of molten wax into the molds and wait till it is solid. This will seal off the part between the toilet roll and cardboard. Pour in the rest and wait till it is completely solid. 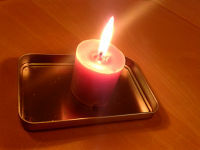 The wax will shrink, so you have to fill up the last bit after the candle has completely cooled down. This page was last edited on 5 January 2014, at 23:34.